From 1929 to 1944, the Philadelphia Toboggan Company’s wooden merry-go-round that is now the centerpiece of Hershey Park‘s Founders Circle in Hershey, PA was once part of Enna Jettick Park in Auburn, NY. The park is now named Emerson Park, after park found Fred L. Emerson of Dunn & McCarthy shoe fame. Because Enna Jettick Park had to be closed during WWII due to gas rationing that prevented patrons from visiting the park, many of the rides deteriorated. 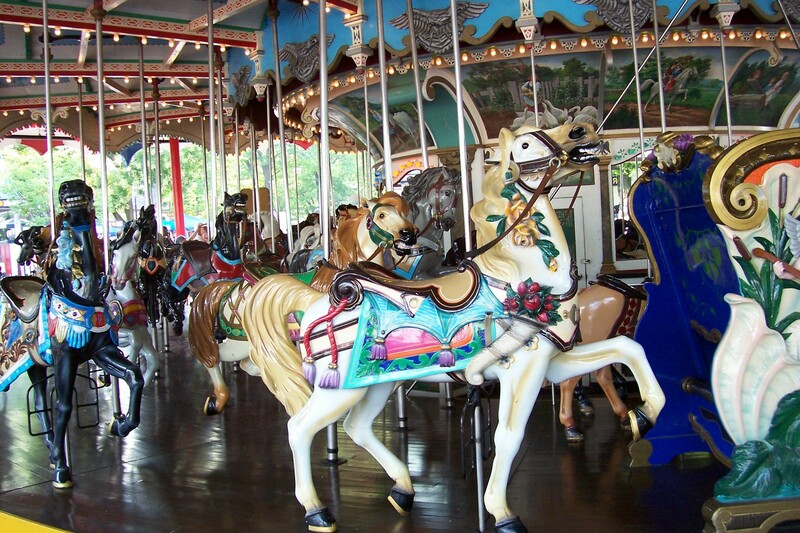 The merry-go-round was purchased by Hershey Park in 1944, was restored, and it has been in Hershey ever since. It still sports the original signmaker’s spelling of “Carrosel” and has 42 Jumping Horses, 24 Standing Horses and 2 chariots. Photo by Carol White Llewellyn copyright © 2011. All rights reserved.